For some businesses, bankruptcies are opportunities for a fresh start. For others, declaring bankruptcy can feel like admitting defeat. Attempting to get your financial obligations in order is admirable, regardless of how it feels to declare bankruptcy. So why is it so hard to obtain funding from a funder in the merchant cash advance industry after a bankruptcy has been declared? Some funders can stomach the idea of funding clients that have had some financial difficulties in the past as long as their underwriting team deems the client eligible for funding. However, extremely diligent underwriting must be dedicated to these situations on a case by case basis. 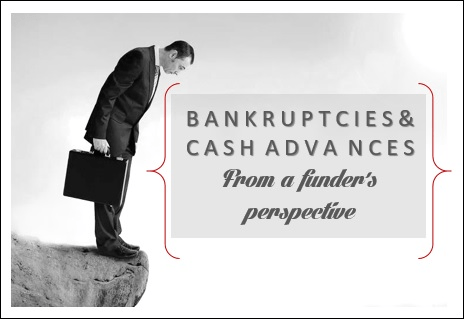 Most funders are very wary of bankruptcies. A client’s financial condition can be extremely fragile after declaring. Asset allocation is of increasing importance post-BK– even more so than during the months of tightrope walking that led up to declaring. Clients that are on payment plans are at risk of having their bankruptcy dismissed without any of the debts being properly discharged if they miss just one payment. Thus, most funders will only consider bankruptcies that are completely discharged and are more than one year old.